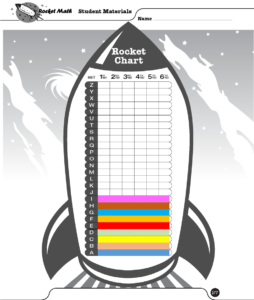 A—What is the overview of how Rocket Math® runs? Please, please, please DO NOT attempt to run the program after reading only this overview. It would not be a good thing. Someone could get hurt. OK, so not really, but it really isn’t a good idea. Trust me on this one! Watch this video at least! Administer the one-minute Writing Speed Test. Use the Goal sheet to select goals for each student based on writing speed. Begin the whole class at Set A or administer the Placement Probes. Each student has the lettered sheet on which they’re working. Each student has an answer key packet. Students practice in pairs for two to three minutes each. Student says the facts and the answers around the outside of the sheet. Partner with answer key fixes up hesitations and errors. After two to three minutes the students switch roles. Students record their goal for the one-minute timing test inside the box. One-minute timing test inside the box is administered to the whole class. All students record the date for this try on the Rocket Chart. Work on the same practice/test sheet again the next day. Administer the same two-minute timing to all students working in an operation. Students correct each others’ two-minute timings. Teacher monitors students charting their scores on the Individual Student Graph. Teacher recognizes anyone who beats their previous best score. ← B—What is automaticity? and Why is it important?